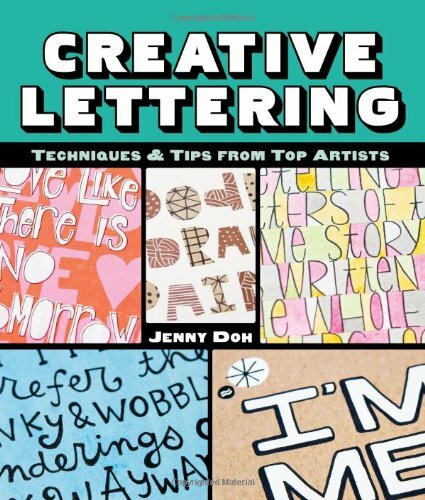 Creative Lettering is a really fun book to look at if you're lettering or calligraphy work. 16 artists and their wonderfully handwritten and designed letterings are featured. Author Jenny Doh has done a great job seeking these artists out and showcasing their work. The letterings are very beautiful and since they are hand drawn, they have lots of personality. Some have designed the whole set of alphabets. Others use letters as a design element for their illustrations. There's a good variety to look at. Each artist also explains how they created their letters and also provide a list of materials to get started. They use the standard pens, paper, markers and other stationery. This means you can start with whatever you have on hand. It's a great book for inspiration. If you use sketchbooks, you can spice up your pages with some creative lettering.